German gynecologist; born at Krappitz, Silesia, Aug. 26, 1833. He studied medicine at the University of Breslau, where he received his degree in 1855, engaging in practise as gynecologist in that city in the same year. 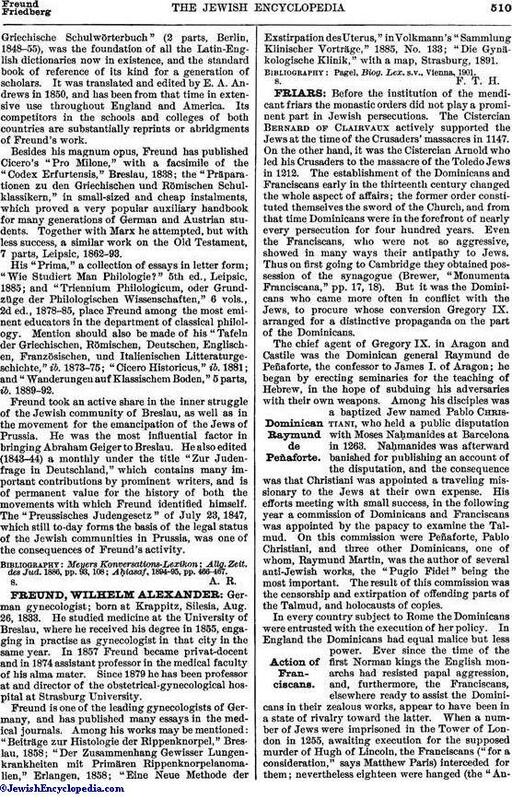 In 1857 Freund became privat-docent and in 1874 assistant professor in the medical faculty of his alma mater. Since 1879 he has been professor at and director of the obstetrical-gynecological hospital at Strasburg University. Freund is one of the leading gynecologists of Germany, and has published many essays in the medical journals. Among his works may be mentioned: "Beiträge zur Histologie der Rippenknorpel," Breslau, 1858; "Der Zusammenhang Gewisser Lungenkrankheiten mit Primären Rippenknorpelanomalien," Erlangen, 1858; "Eine Neue Methode der Exstirpation des Uterus," in Volkmann's "Sammlung Klinischer Vorträge," 1885, No. 133; "Die Gynäkologische Klinik," with a map, Strasburg, 1891. Pagel, Biog. Lex. s.v., Vienna, 1901.